Jullian, the son of a church mate turned 2. 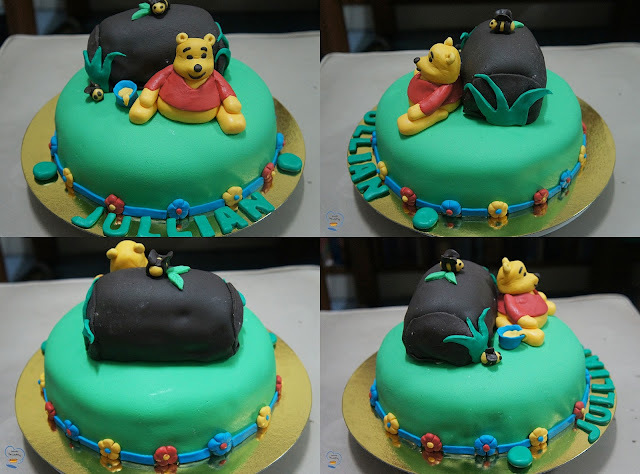 He fancies Winnie the Pooh so his mom asked me to make a Winnie the Pooh cake. When I showed up at the kindergarten class on Saturday, every one went gaga over it. Kids couldn't take their eyes off of it. I made chocolate cake, frosted it thinly with vanilla butter cream. I did not chill the cake because the last time I covered a chilled cake with fondant, condensation formed and the fondant looked shiny and wet. Instead, after applying crumb coat, I immediately worked with the fondant and covered the cake with it. I used a toothpick to add icing color bit by bit into the white fondant. 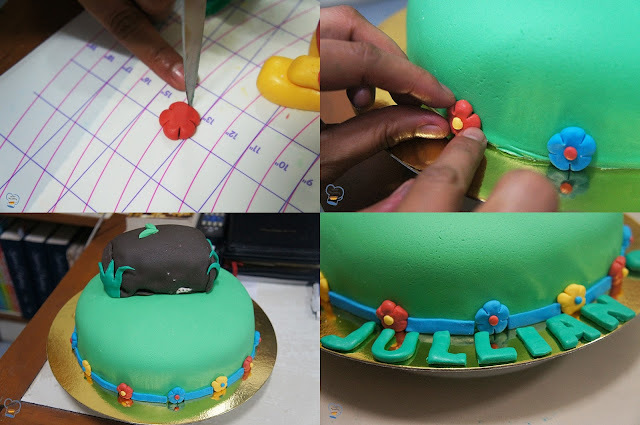 I knead it over and over until I get even spread of the color and reached my desired shade and the fondant was smooth, soft and pliable. 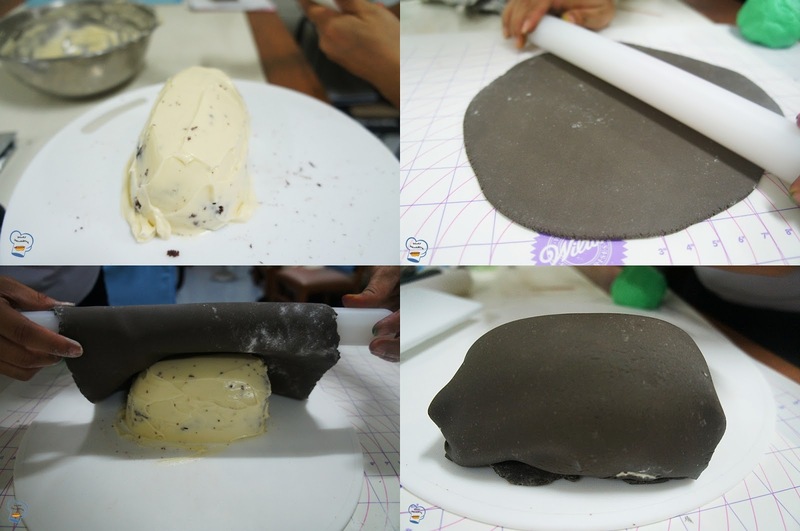 I rolled out the fondant into a size bigger than my cake. I used a mixture of corn flour and icing sugar (50/50) to sprinkle into my work surface while I rolled fondant to prevent it from sticking into the counter. 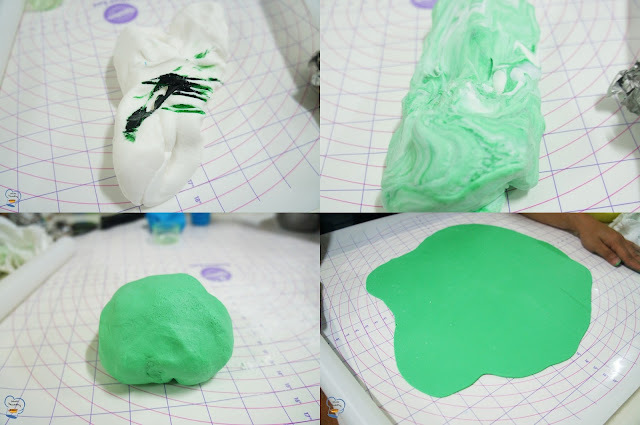 This green fondant was used to cover the base. I picked up the farthest edge of the fondant and rolled it over the rolling pin towards me. I draped the cake, starting from the side then to the top. I continued unrolling until it hang below the bottom. 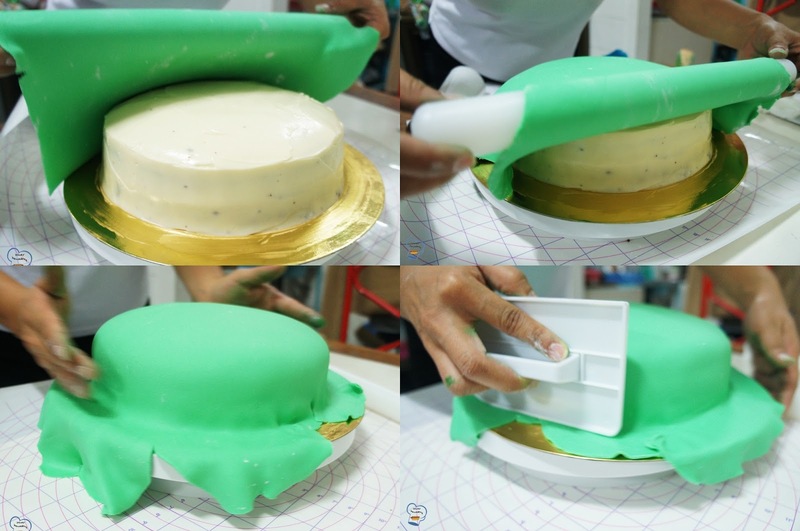 I pressed firmly but gently to remove air packets and smoothed the fondant with a cake smoother. I cut off all the excess with a pizza cutter. I worked on the log after finishing with the base. I was not happy with the result so I had to decorate it with leaves to make it look like a log. I then placed the log on top of the base. I used a skewer to stick the log to the cake. I followed an online tutorial for Winnie the Pooh. I was successful making the body, shirt,legs and arms. The body was formed into a shape of a pear. For the legs, I rolled fondant logs and tapered one end. I stick the logs to the body. 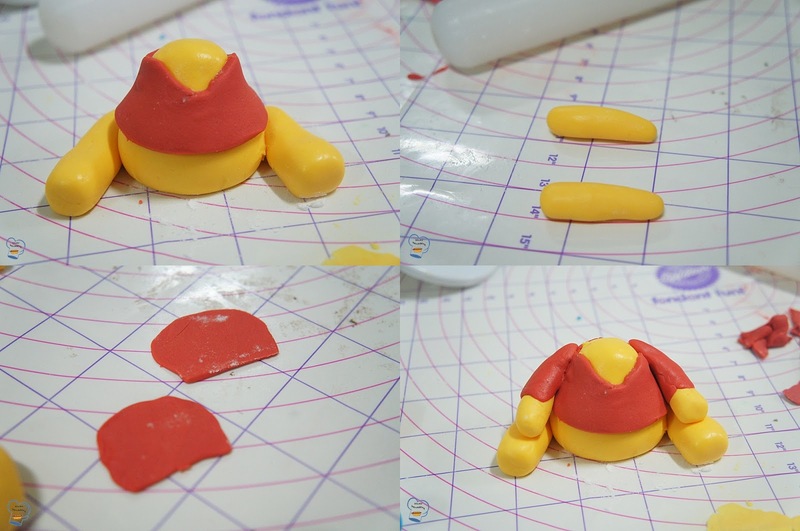 My sister cut a small part of red fondant for the shirt. She wrapped it around Pooh's body. For the arms, I used smaller pieces of fondant and rolled them into logs. My sister worked on the sleeves while I made the face. 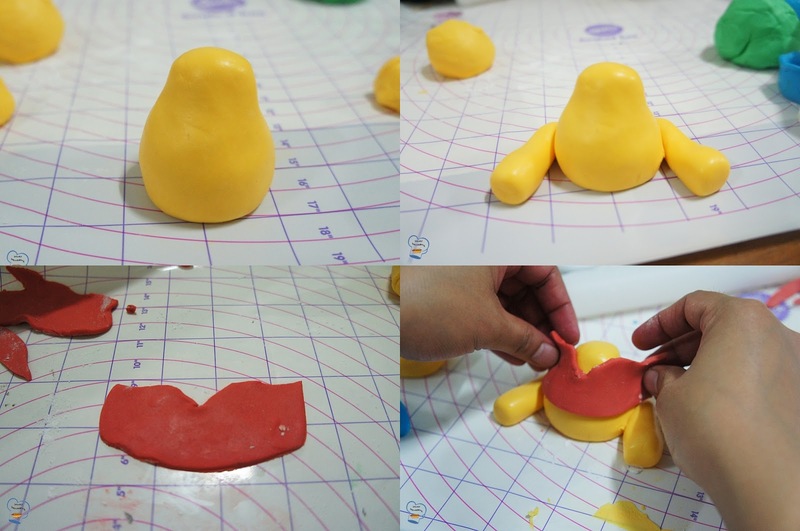 Making a face which would look like Winnie The Pooh was the most difficult part. The online tutorial was a bit confusing for me so I did the face by following what I remembered. After 7 attempts, I was finally able to make a face that resembled Winnie. Yipeeeeeeeee!! My sister and I both worked on the decoration of the base. She made flowers and I did the strips. She also added some grass on the log and created letter shapes for Jullian's name. Here's the final stages of decorating. I placed Winnie The Pooh's body on the base leaning on the log. I stick the head into the body with a toothpick. My sister made the jar with honey. Using the leftover yellow fondant which I used to make Winnie The Pooh, I made two honey bees. I placed one on top of the log, the other beside the honey jar. Here's Winnie the Pooh cake.